Dogs are cool. Skydiving is cool. So why not have both? Advancements in technology have made it possible for dogs to experience the thrill of skydiving the same way that humans do! Skydiving dogs are becoming more popular in numerous industries. Just a few of those industries are mentioned below. German Shepherds, Belgian Malinois, and Labrador Retrievers are the most popular breeds of military dogs. They are highly skilled and thoroughly trained just like their human counterparts. There are currently over 600 dogs serving in Afghanistan and Iraq alone. Even though dogs have been involved in military operations dating back to the Civil War, it wasn’t until 1942 that canines were officially inducted into the United States Army. It is said that dogs are used in these Middle Eastern countries because they can be used to deescalate an unruly group of people. Dogs are typically not used as pets, making them fairly intimidating in a chaotic situation. The Navy SEALS utilized canine support during the Osama Bin Laden raid of 2011. The dog, Cairo, and Navy SEAL Team 6 were lowered from an MH60s helicopter to get into the compound. Typically, dogs jump in tandem with their handlers, but if they are properly outfitted with floatation devices, they are able to make short jumps into the water on their own. 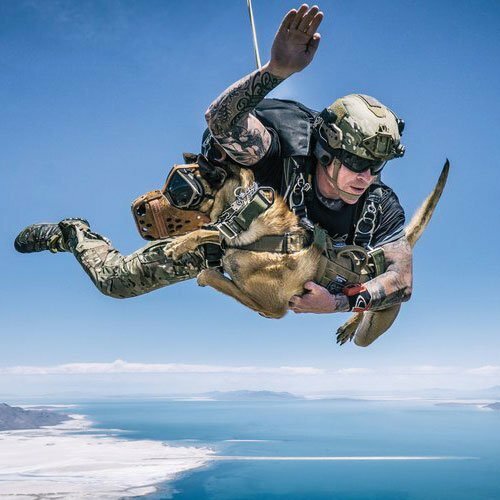 The highest man/dog parachute jump was made from 30,100 feet by Navy SEAL Mike Forsythe, and his dog, Cara. These military canines are typically equipped with a camera on their back and an earpiece for them to receive remote instructions. However, advanced dogs like this are used for more than just military operations now. As of 2017, the poaching industry in Africa has become a multi-million dollar industry. Every day, there are 100 elephants killed for ivory. In 2016, over 1,000 rhinos killed for their horns. The war against poaching requires an “outside of the box” in order to catch these criminals. Most popular poaching areas are often remote with dense shrubbery. Skydiving canines allow for them to reach those areas quickly and track the criminal poachers. Canines are perfect for these operations because they can also hunt at night when humans cannot due to limited visibility. They are also more aware of snares, firearms, and other traps. There are five fearless members of the Paramount Group Anti-Poaching and Canine Training Academy, their names are Giant, Killer, Venom, Alpha, and Arrow. 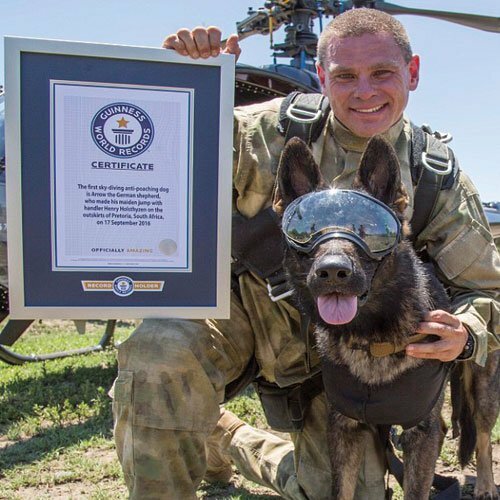 Killer was awarded a Gold medal from Prince Harry for snaring 115 groups of poachers, but Arrow is in the Guinness World Records for being the first dog to skydive. Arrow and his handler, Holsthyzen, have eaten, slept, and worked together for months with intense preparation in order to carry out these high-pressure tasks. Even though their important contribution to anti-poaching efforts went unrecognized at first, almost all big reserves have K9 assistance now. Since federal authorities control a majority of aviation, they are not fond of the idea of canines skydiving for sport. There are very few dogs that are allowed to skydive with their owners. Most cases, the pups skydiving for fun are part of BASE-jumping families. Even then, most dropzones do not allow dogs in their facilities, even on a leash. The fast-paced, high-energy environment is not the best environment for our fur babies. But we highly recommend skydiving so that the next time your dog sticks their floppy ears out the car window, you’ll know exactly the feeling they are experiencing. Pure bliss. Take a day and experience this with Skydive Philadelphia! Call 215-258-2255 today! 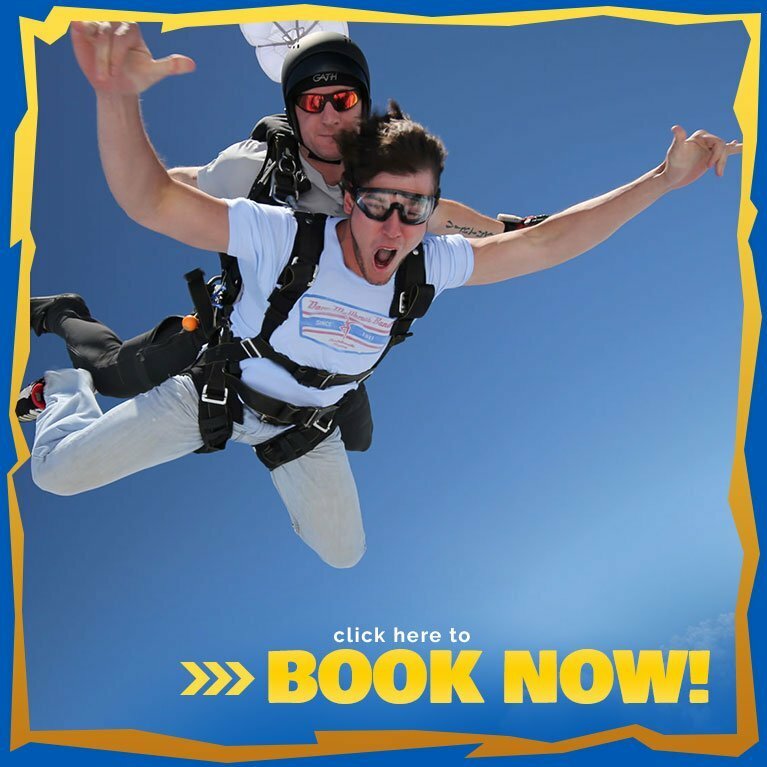 Want to Learn More About Skydiving?